Every year since 1986, Golden Apple has selected outstanding teachers to receive the prestigious Golden Apple Award for Excellence in Teaching. This year, it came to no surprise that Mrs. Raygoza, AP Spanish teacher, won this prestigious award. Always going above and beyond for her students, Mrs. Raygoza is beyond grateful for the new opportunities this award will be provided to her. Winning Golden Apple wasn’t an easy feat, as it required extensive time and numerous essays to be a finalist. “I wrote multiple essays after the nomination and then I finally was called as a finalist. The final step was to make it to the top ten and I made it!,” said Mrs. Raygoza. process, Mrs. Raygoza’s diligence to always give her best worked out! During her last class of the day, she was pulled out of class and was told it had something to do with College Board. Worried that it had something to do with her AP students she went right away. However, to her surprise it was a surprise from Golden Apple! She had been selected to receive this award! 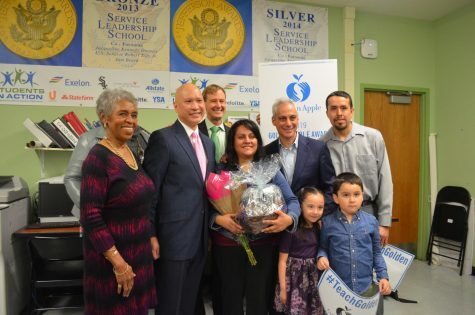 To celebrate Mrs. Raygoza’s students, colleagues, family and even Mayor Emanuel surprised Mrs. Raygoza with flowers, hugs and congratulations! “Honestly, when I wrote the essays I thought no way I have a chance; then when I became a finalist I still did not fully believe I could win. Once I knew that I did not get a call yet; I had hope. 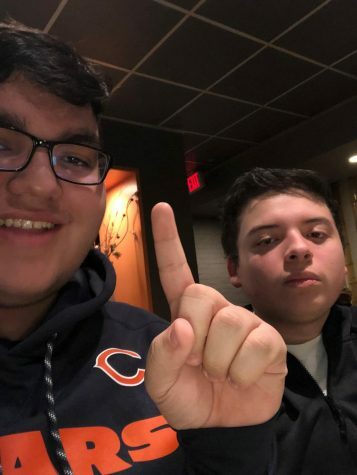 There were also rumors from other teachers and students’ and that’s when I thought that I could be a winner,” said Raygoza. Immensely grateful, Mrs. Raygoza’s future steps are to go to Northwestern University to continue to study. Even though Mrs. Raygoza’s feels that she has been in school all her life, she says, “a good learning experience is always a good one.” Mrs. Raygoza will once again be in the eye of the camera when she will receive her Golden Apple on May 18th. Excited and humbled by this award Mrs. Raygoza plans to give her best to her students.